Vowels are made without an obstruction in the vocal tract, so they are quite sonorous. The body of the tongue moves in the mouth to shape each vowel, and for some vowels, the lips are rounded as well. Linguists classify vowels according to four pieces of information: tongue height, tongue backness, lip rounding, and tenseness. 1. What is the articulatory description for the vowel sound represented by the IPA symbol [i]? High front unrounded tense vowel. Mid central unrounded lax reduced vowel. High front unrounded lax vowel. High back rounded tense vowel. High back unrounded lax vowel. 2. 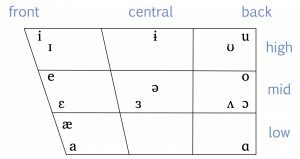 What is the articulatory description for the vowel sound represented by the IPA symbol [ɛ]? Mid front unrounded lax vowel. Mid back rounded tense vowel. Mid central unrounded lax vowel. 3. What is the articulatory description for the vowel sound represented by the IPA symbol [ɑ]? Mid back unrounded lax vowel. Low back unrounded lax vowel. Low back unrounded tense vowel. Remember that the difference between consonants and vowels is that consonants have some obstruction in the vocal tract, whereas, for vowels, the vocal tract is open and unobstructed, which makes vowel sounds quite sonorous. We can move the body of the tongue up and down in the mouth and move it closer to the back or front of the mouth. We can also round our lips to make the vocal tract even longer. Now do the same thing, but leave off the “b” and the “t” and just say the vowels. You can feel that your tongue is at the front of your mouth and is moving from high in the mouth for [i] to fairly low in the mouth for [æ]. We can do the same thing at the back of the mouth. Say the words boot, boat. Now do it again with just the vowels, [u] [o]. Your lips are rounded for both of them, but the tongue is higher for [u] than it is for [o]. The lowest vowel at the back of the mouth is [ɑ]. We don’t round our lips for [ɑ], and we often drop the jaw to move the tongue low and back. But there are no monosyllabic words without a final consonant that have a lax vowel as their nucleus. And if we were to try to make up a new English word, we couldn’t do so. We couldn’t create a new invention and name it a [vɛ] or a [flɪ] or a [mʊ]. These words just can’t exist in English. So the tense/lax distinction is an example of one of those bits of unconscious knowledge we have about our language — even though we’re not consciously aware of which vowels are tense and which ones are lax, our mental grammar still includes this powerful principle that governs how we use our language. Here’s one more useful hint about tense and lax vowels. When you’re looking at the IPA chart , notice that the symbols for the tense vowels are the ones that look like English letters, while the symbols for the lax vowels are a little more unfamiliar. That can help you remember which is which!